Text forms part of our daily lives. Road signs, headlines and advertisement communicate with people without making a sound. In perhaps more thoughtful text, words enclosed in novels, type in a newspaper article or the verse of a poem can be a source of deep inspiration. 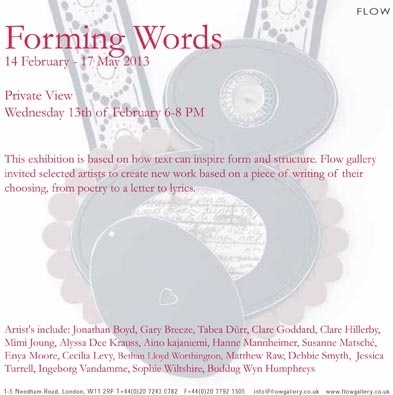 Flow’s forthcoming exhibition Forming Words is based on how form and structure can be inspired by text. Flow has asked selected artists to create new work based on a piece of writing of their choice, from poetry to a letter to lyrics. Whether it is the shapes, lines and curves which letters create that inspire the work, as in vibrant wall pieces by Debbie Smyth that motivate the work. Or simply the fluidity of the writing, artists exploring this theme express the diverse approaches and outcomes this one theme can manifest. 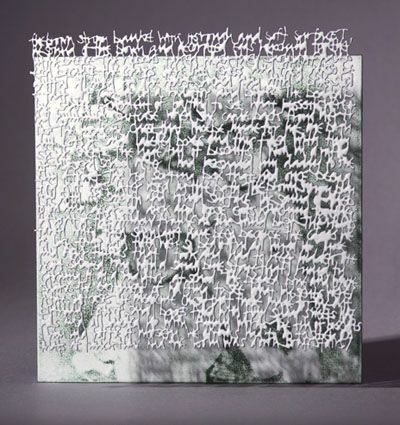 Many of the artists have chosen to utilise the meaning of their selected text or the message that the text communicates to inform their work. 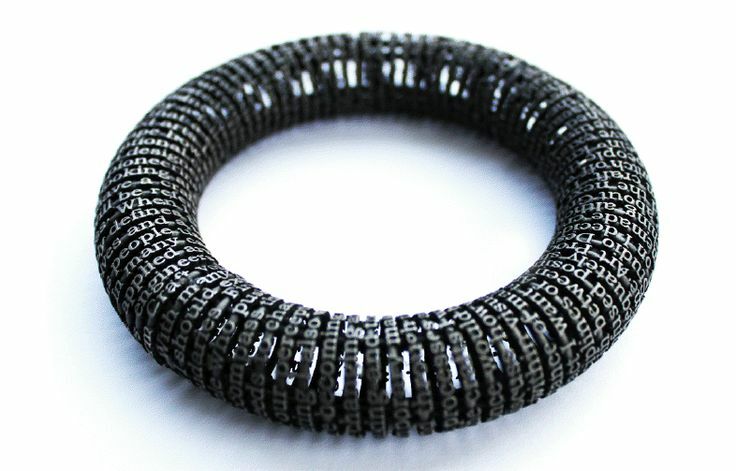 Other artists, such as Aino Kajaniemi take a personal approach to using text with particular memories woven in thread. Artist’s include: Rut-Malin Barklund — Adele Brereton — Anthony Bryant — Amanda Caines — Grace Girvan — Simon Grainger — Katy Hackney — Sachiyo Higaki — Mark Hanvey — Kota Fukunaga — Tahakashi Kougei — Shigeki Kudo — Markku Lyytinen — Oda Makiko — Malcolm Martin — Hans-Henning Pederson — Corina Rietveld – Wycliffe Stutchbury. This show, curated by Melissa Rigby, the Chairman of the British Society of Enamellers, aims to challenge the pre-conceived ideas attached to enamel by questioning technique, process and aesthetic and to explore contemporary artist’s voices within this ancient medium. Enamelling, the art of fusing glass onto metal with heat, is one of the most ancient and durable means of adding colour to metal. 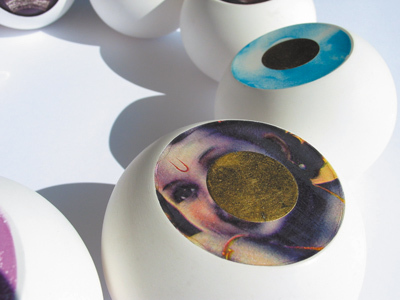 Fused brings together artists who use the traditional enamelling technique in new and exciting ways, creating a fresh visual language for this process. Their application of enamel gives an arresting beauty and unique patina to a diverse group of objects, panels and jewellery. 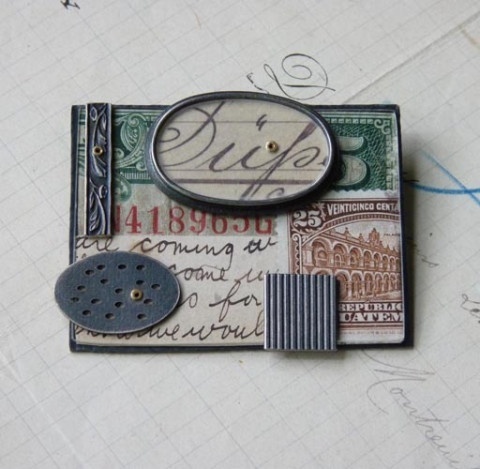 Bettina Dittlmann is inspired by historical jewellery, ranging from mourning Victorian jewellery to American Indian pieces. Dittlmann studies the historic forms and content, which later influence her own work. 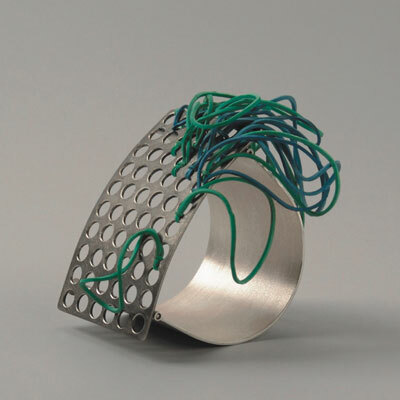 Drawing is an important part of Bettina Dittlmann’s life, often a starting point for a piece of jewellery. 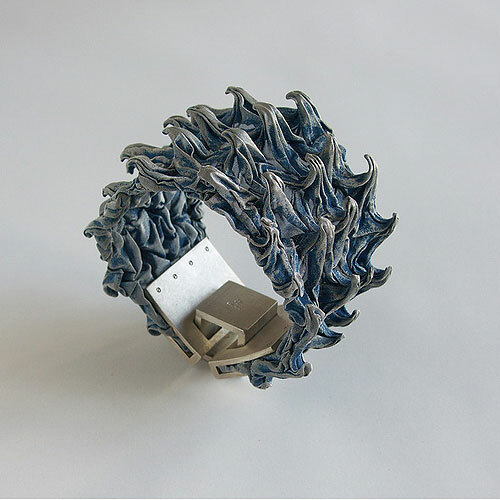 Carola Bauer captures incidental gestures in her jewellery; the cinema ticket in a coat pocket, twisted to a paper roll or the accordion-folded slip of paper. Bauer hopes to remind the observer of gestures. 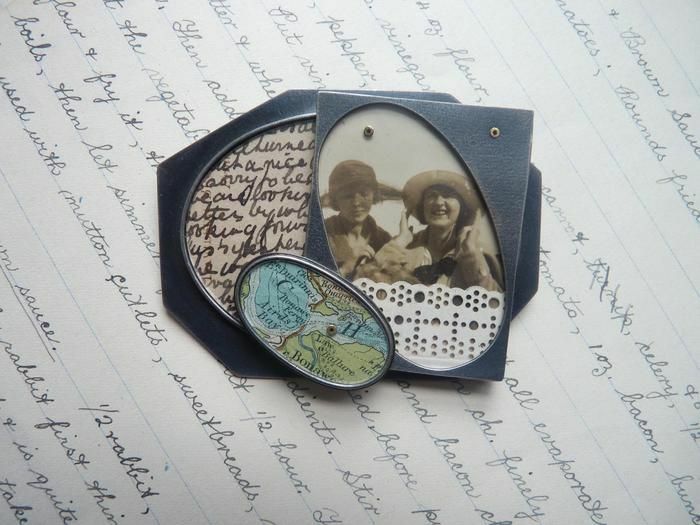 The surprises that she experiences in the search of forms also happen during the handling and use of enamel colours. Stacey Bentley is inspired by urban scenery. Becoming increasingly attentive to the unexpected and unnoticed components of this industrial environment allows Bentley to discover an elegant and mysterious aesthetic. The jewellery explores the new possibilities and ideas that industrial liquid enamel can bring to contemporary jewellery. Lydia Feast explores the concept of contrasting elements. Echoing references to time and nature whilst combining a modern clean aesthetic, this collection ‘Chaos &Calm’ brings together contrasting elements illustrating a harmony between chaos and calm, new and old and silence and noise. Inspired by her research into chaos theory: “the underlining order in some of nature’s most random processes”. Each piece is unique as a result of the carefully controlled but ultimately random outcome. 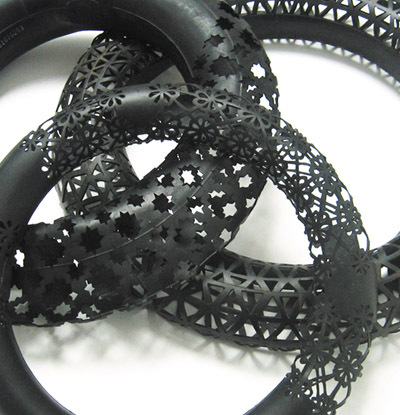 Kye-Yeon Son explores positive and negative spaces through her branch structures. Her work symbolizes the human cycle of growth, death, and renewal. They seem to capture intangible emotions, spirits or memories. 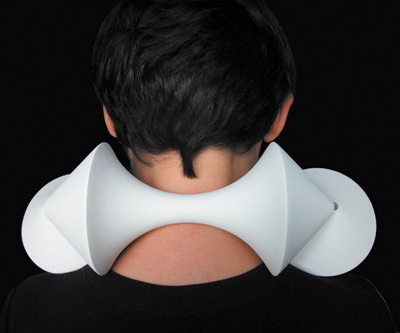 Hiroki Iwata takes inspiration from nature around him describing it as « an irreplaceable treasure ». 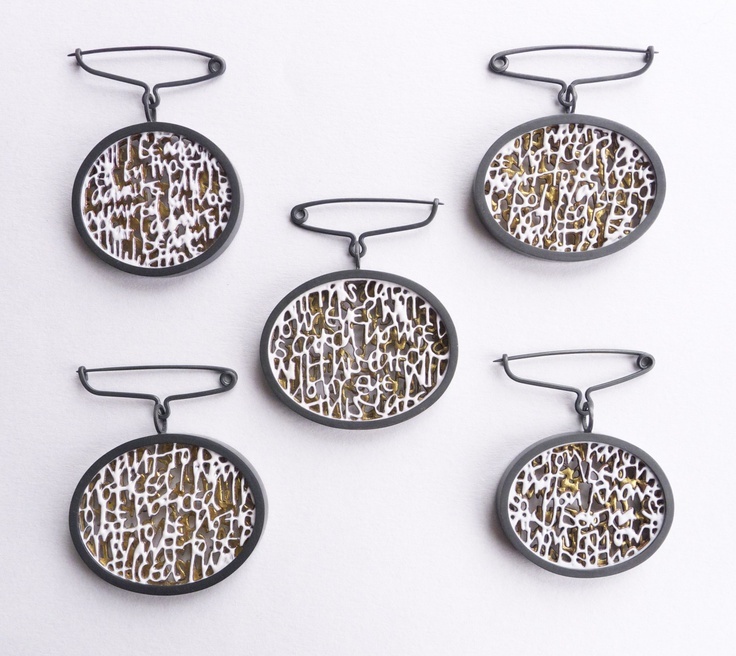 His brooches made of silver, enamel and aluminium foil reflect his aim to produce feelings of empathy with the motifs of the natural world in the viewer. Relaunched at the Saatchi Gallery in May 2009, COLLECT has an enviable reputation as a premier, annual fair for contemporary craft. Through its presentation of work from the best international applied artists, COLLECT has become a prestigious event in the international cultural calendar gaining the respect and support of many private collectors, museum curators and galleries. Parfois je vous présente des expositions dont la date est largement dépassée … mais dont le thème -et l’intérêt- dépassent largement la date ! En particulier, parmi mes « recherches italiennes », une série d’expositions « par pays » qui nous permet un tour de l’Europe des plus intéressants ! 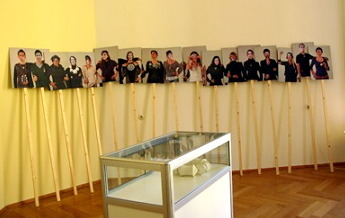 A 2005 touring exhibition showing the works in Italy of fifteen Swedish jewellery artists. The selection of the artists was made on the basis of conceptual work that could reflect the countries’ culture, nature, climate and general characteristics, representative of the Scandinavian way of interpreting life. 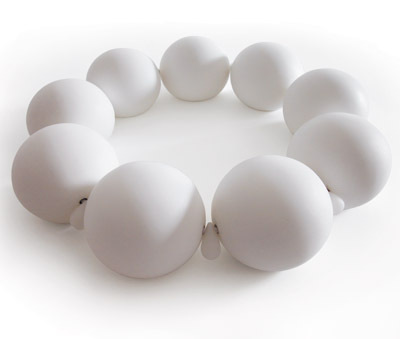 « Contemporary Swedish Jewellery« is curated by Marie-Josè van den Hout, the director of Galerie Marzee in Nijmegen Netherlands and it is touring five countries and 7 venues. Appreciating that van den Hout considers rings small sculptures, and necklaces akin to drawings and paintings, helps us understand her curatorial decisions. longer do these makers tie their inspiration exclusively to nature and geometry, they absorb and rework the multiple modes of expression that contemporary popular culture emits. These pieces discuss perception, identity, social interaction, art theory, philosophy and sociology; consider the artistic statement of each piece asides to its wearable functionality. Van den Hout has chosen outspoken, more conceptual pieces, where we find form replaced by content. Be aware of self-referential comment on the Swedish traditions of nature and romanticism, and see this less design-orientated approach as refreshing as it is challenging. 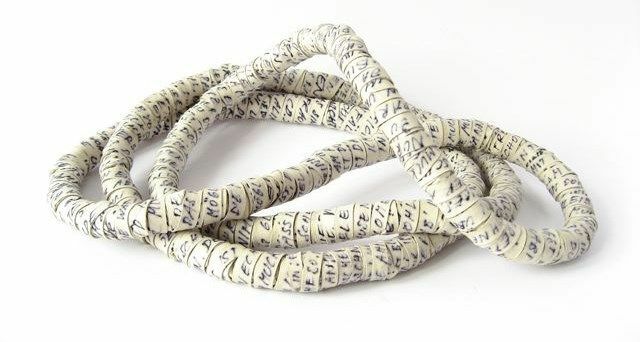 Witness Aud Charlotte Ho Sinding‘s grand rubber jewellery, in particular her birds ‘carried’ by the wearers hand; defiantly sculptural, they question the bond between us and nature. The relationship between us and the actual material, is provoked by Ulrika Swärd‘s sound pieces. 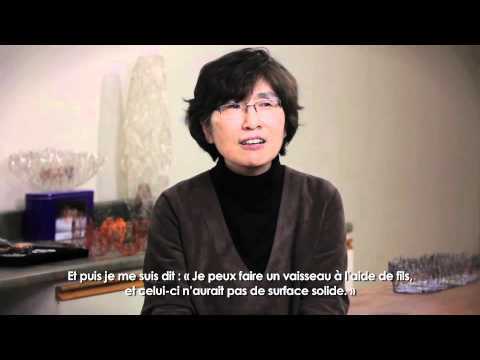 Her work gives proof to organic source materials – such as metal and pearls – not necessarily being the only starting point. In contrast, Charlotte Skalegård and Anna Unsgaard‘s work echoes the perfectionist goldsmith techniques of past generations; in so much as their work is imbued with a real sense of artist’s labour. Although their choice of materials may be stainless steel and copper, the detailed textile techniques used reference the artistic process in a very clear way. 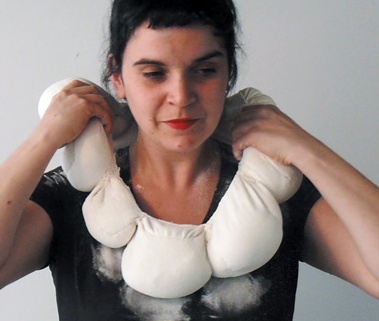 Dental plaster is the unexpected material involved in Ida Forss‘s work, look out for her witty teeth necklaces. 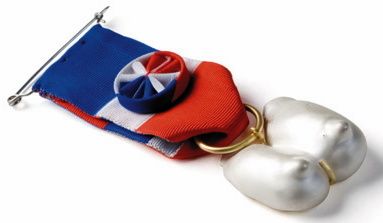 This humorous theme runs to Sissi Westerberg‘s brooches and bracelets, melting as they do over pocket lips. Tobias Andersson‘s badges in various precious and semi-precious materials will make you smile too. Compared to the development in countries like the Netherlands, Germany and Great Britain, Swedish art jewellery was long marked by slow changes and preservation of traditional craftsmanship qualities. The new jewellery movement gained widespread acclaim in Sweden only in the late 1980s. However, since the entry of this new and liberated approach in regards to materials, techniques and themes, its application has often been cautious. The vulgar, grotesque and in other ways visually provocative expressions have only in recent years made its way into the Swedish jewellery scene. Today, nature and geometry are seriously trailing behind as the preferred sources of inspiration, in favour of contemporary popular culture and its wide-ranging modes of expression. In this meaning the development in Swedish jewellery has clear parallels to movements in other artistic fields, not only in the realm of craft. As the domain expands towards discussions on perception, the making of the identity and social interaction, the relation to art theory, philosophy and sociology is becoming increasingly important. Form is replaced by content. 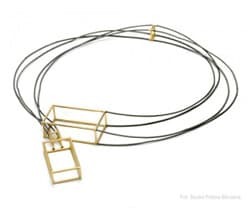 There has also been a shift in working methods in the sense that the jewellers increasingly often formulate clearly defin ed thematic projects, which are left behind upon completion as they move on to the next project. The artistry becomes a stretch of events rather than a continuous flow. This poses challenges to an audience that has become accustomed to appreciate gradual development and refinement of expressive means. Additionally, to a growing extent many young jewellers make embodiments of examinations, events and meetings rather than concrete jewellery. This dematerialization of the art object carries clear references to the art of the 60s and 70s, along with influences from the virtual dimensions and communication patterns in contemporary society as well. It is important to remember that the Swedish body of artists has become increasingly international. Many of the artists in the exhibition have studied abroad and several of them are born in countries other than Sweden. Compared to most other branches of Swedish craft, the jewellery artists have been actively partaking in the international exchange arena, partly as a result of having been schooled by university teachers with foreign backgrounds and frequent participation in workshops abroad. That the aim is shifting focus away from a nationally defined style is evident. In this context it is worth noting that some jewellers still favour moti fs that expressively side with the famed Nordic sense of nature. Today however, this is rarely simply a result from unreflecting romanticism or tradition. Many pieces based on natural forms hold double meanings: they are not only referring to nature but also become commentaries to the tradition of nature romanticism itself. In Sweden, this tradition may be traced back to the poetry of the 18th century, and reached its most significant form during the era of nationalist flirtation in the past centurial turn. Today, the Swedish relationship to nature is mirrored and retold through channels such as advertising and popular culture. To the artists, the nature theme lends itself as a mean to relate to questions on identity, tradition and change. Karin Johansson may serve as an example of an artist who forwards parts of the nature-oriented tradition, but in the form of a personal world of imagery with many idea sources. In the geometrical forms that dominate her jewellery, flowers, leaf forms and other references to the natural world are often present. However, there is an affinity to an unobtrusive and emotional sphere established here as well, where a subtle play of opposites takes place, between the concealing and the advancing, between isolation and interaction. In many aspects however, it is the human body that has become the unifying basis to the jewellers. 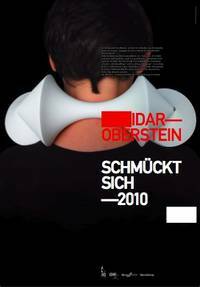 The fact that the object of jewellery, positioned in the interface between the individual’s body and society, offers unique access to current discussions within a number of cultural contexts is more or less a truism. To the young Swedish jewellery artists, the subject of the body is not so much an art historical motif as it is a thematic assessment of it as a concept and social phenomena. 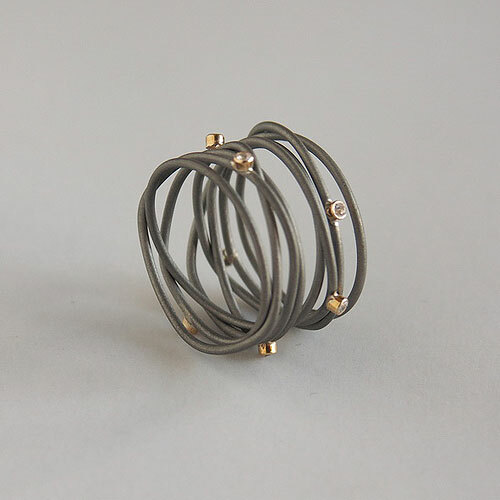 The jewellers tend to relate to the body as a changeable quantity, shaped by the rules and values of the external world as well as by the individual’s feelings and yearning for expression. Every once in a while, the unexpected or even unpleasant presses through the conventional beauty. Teeth, fingers and eyes may appear as motifs, with evident references to the state of interchangeability that body parts have today. Cloning in the medical sciences, as well as today’s frequently exposed fascination for plastic surgery, both form foundations for artistic themes. That this fits well into the international trend of jewellery as well as the visual arts hardly needs mentioning. In Aud Charlotte Ho Sook Sinding‘s sculptural rubber jewellery, with their somewhat ghostly depictions of flowers and birds, a contradictory bond between human and nature transpires. The carrier must subject to Aud Charlotte Ho Sook Sinding’s voluminous pieces of jewellery, resulting in the appearance of nature getting the upper hand. In this sense the objects join up with the discussion on the relationship between carrier and object. Who in this relationship is the carrier of expression? If the jewellers whose theme is the body have set beauty aside, there are others that consciously choose the beautiful as a mode of communication. Beauty can be emotionally moving and create reactions: as an object with historical ties to desire and seduction, the pretty piece of jewellery opens up to associations of power and submission. Beauty becomes complicated in the complex process of personal interpretation and projections. The contradictions are often readily present in the artistic manifestation of the beautiful. In Agnieszka Knap‘s leaf and flower shaped pendants, the beautiful balances on the verge of a violent expression. The porous enamel surfaces can give a scorched impression, like human bodies whose keepers have burnt them in the sun for the sake of vanity. This goal may seem vague, but is representative of a young generation of artists that are anxious to avoid locking the audience’s relationships to an interpretations of their work to established models. 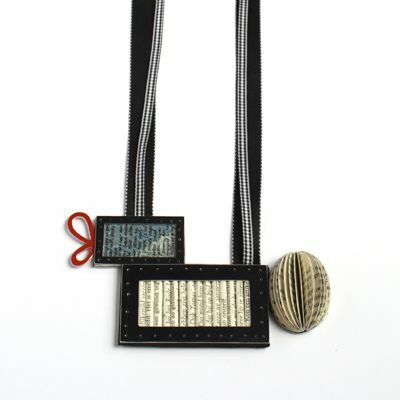 The emphasis is placed on the intimate relationship between the piece of jewellery and its carrier. Perhaps a common tendency in young art is traceable here, one that aims to avoid too substantial pretences. Meetings and events – creating new contexts formed by the individual viewer’s own life experiences – is more important than the universal autonomy of the art piece. The relationship to the materials offers another access point to the review of Swedish art jewellery in this exhibition. Over the past two decades a gradual change has occurred regarding the choice of materials. Metals, stones and pearls are no longer the obvious starting point. Some of the pieces by Ulrika Swärd are examples of how even sound can be an element in the production. Organic and in other ways frail materials are also used by many jewellers and the characteristics of the material then itself turns into a carrier of meaning. Brittleness can be used as a metaphor for the perishability of life and a reminder of that we must take care with the most fragile and valuable of all – human relationships. In many pieces, not only the materials emerge carriers of meaning, but the time factor as well. Some examples are Charlotte SkalegŒrd and Anna Unsgaard‘s detailed textile techniques that charge the objects with time – a true scarcity in our day. The prosaic materials, thin wire made of stainless steel and copper respectively, are not inherently valuable, but the time that has been invested in the manufacturing process makes the pieces lavish, and therefore alluring objects. In contrast to many older and perfectionist goldsmith techniques, the traces of artist’s labour are clearly perceptible. 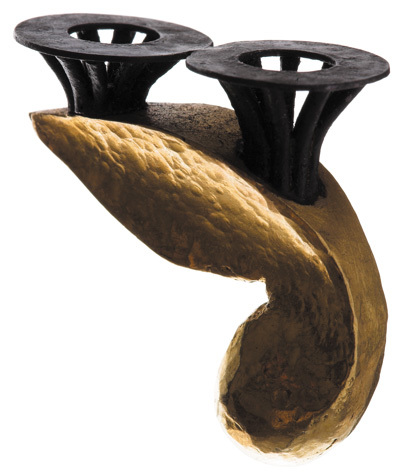 « Contemporary jewelry, in France and abroad, is undergoing a spectacular evolution : in recent years, it has both staked out new territories of experimentation, and claimed a pivotal position between art, design and traditional craft. The title of this exhibition underlines the specificity of contemporary jewelry, and the ambiguity inherent to a craft-based, boundary-pushing practice : the work selected is thus both alien to its tradition, and well versed in its history. The selection for this touring show focused on the work of 17 artists – French, or working in France - who together make a convincing case for the vitality of this rather under-exposed part of the European contemporary jewelry community. Je ne vous communique pas cette information pour l’exposition en soi, mais bien pour ce paragraphe que j’ai souligné en rouge et qui m’a sauté aux yeux : il existe donc en France des gens qui veulent aider au développement et faire connaître la création de bijoux contemporains FRANCAIS !! J’ai été époustouflée, surprise, et … REJOUIE ! Enfin ! cela a le mérite d’être connu et reconnu, dit et diffusé !! LA GARANTIE – ASSOCIATION POUR LE BIJOU - Objet : organisation d’évènements artistiques, expositions d’art, colloques, festivals, workshops, journée d’études, plates-formes d’échanges, ou toutes autres manifestations à caractère culturel, la rédaction de textes et la production d’objets, l’édition de brochures, catalogues, livres et divers autres ouvrages et objets, la constitution d’un fonds de documents et d’oeuvres, le recueil, la préservation et l’analyse de toutes données (objets, documents, archives, dessins, films et autres supports) relatives à la profession de bijoutier, exploitation de ces données à des fin scientifiques et de mise en valeur de cette profession et de ses produits sous toutes les formes possibles, décloisonner les activités liées au bijou, et non la représentation d’une profession ou de ses acteurs.